An African violet starts to bloom. Photograph: marimbajlamesa on Flickr. ‘Jersey Snowflakes’> Photograph: Annie Rieck. African violets have been loved and nurtured by generations of houseplant growers, but they’ve got a reputation as plants that our grandparents love to grow: cute, maybe, but not cool. That’s changing, though. Many of us are (re)discovering that African violets make wonderful houseplants! And now there’s more choice than ever before, as breeding programmes have created a rainbow of flower colours and styles, an array of variegated leaves, and tiny teacup plants as well as dinnerplate-sized ones. I talk to African violet grower and show judge Annie Rieck about why she loves these plants, and how to grow them successfully. Annie has her own podcast called All About African Violets and has been growing them since the 1990s. Annie Rieck’s AV light carts. Photograph: Annie Rieck. Saintpaulia ‘Senk’s Alchemy Morning Star’ (I have just ordered one of these from Dibleys!). Photograph: 阿橋 HQ on Flickr. African violets (we’ll call them AVs from now on) are often sold in big box stores potted in peat moss: this growing medium is very water-retentive, and so it’s very easy to overwater them. If you buy one from this kind of seller, repot immediately into specialist AV potting mix. The most common reason why AVs fail to bloom again is not enough light. They like bright indirect light and will not flower if left far away from a window. According to the African Violet Society of America, the correct luminosity for African violets is 10,000 to 12,000 lux, or about 900 to 1100 foot candles. Annie finds an East or Northeast exposure is best. 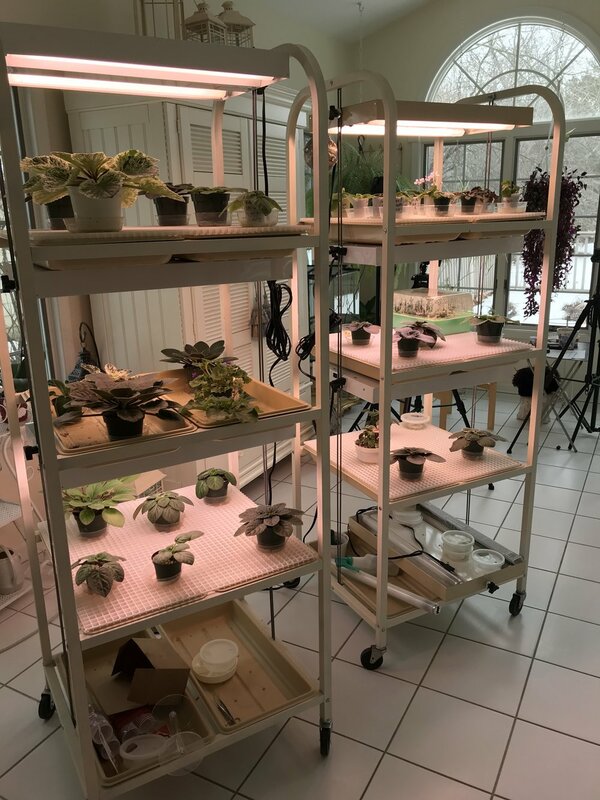 However, Annie grows most of her AVs on light carts under T12 lights (pictured) on 2ft by 2ft shelves. They dislike draughts and are happiest in normal room temperatures, ie around 21C/70F. Annie grows her AVs in plastic pots and says ceramic self-watering pots work very well too. AVS come in different sizes! Standards have a plant width of 20 40 cm (8-16 in) and need a 4in/10cm pot; minis are 8-15cm/3-6in wide and need a 2in/5cm pot and semis are 15-20cm/6-8in wide and need a 2.25in/5.5cm pot. When it comes to repotting, standards need to be repotted every six months: minis and semis every three months. You can repot into the same pot: you can carefully remove tired leaves from around the base of the rosette, then set the plant down into the pot to cover the newly-exposed ‘neck’ ie the main stem of the plant. Then trim the roots so that it fits back into the same pot. Use specialist AV growing medium if you can: Miracle Gro, Growth Technology, Espoma and Black Gold are some of the brands available. Or you can mix your own: there’s a couple of recipes for AV soil mixes on this Missouri Botanical garden factsheet. Use a soft paintbrush to clean compost off the leaves after repotting. When it comes to fertiliser, less is more. If you have potted your AVs into a soil mix that has feed already added, you should not add extra fertiliser. If you are using a professional mix as Annie uses for her show plants, you will need to add fertiliser, albeit sparingly she uses a water soluble feed from Optimara. AVs are easily propagated: you can grow them from seed but it’s easier and quicker to use vegetative propagation to grow them from leaf cuttings. Carefully remove a leaf by hand, including the petiole (leaf stem). Make a 45 degree cut across the stem with a sharp knife; Annie always cuts away the top half of the leaf too, although this isn’t compulsory. Fill a pot with damp AV compost and make a hole with a dibber or pencil for the leaf stem, then insert it and gently firm it down. Place in a clear plastic bag somewhere where and light and wait until baby leaves start to show on the surface. Once they are developed into a small plant, it can be potted up and the bag removed. 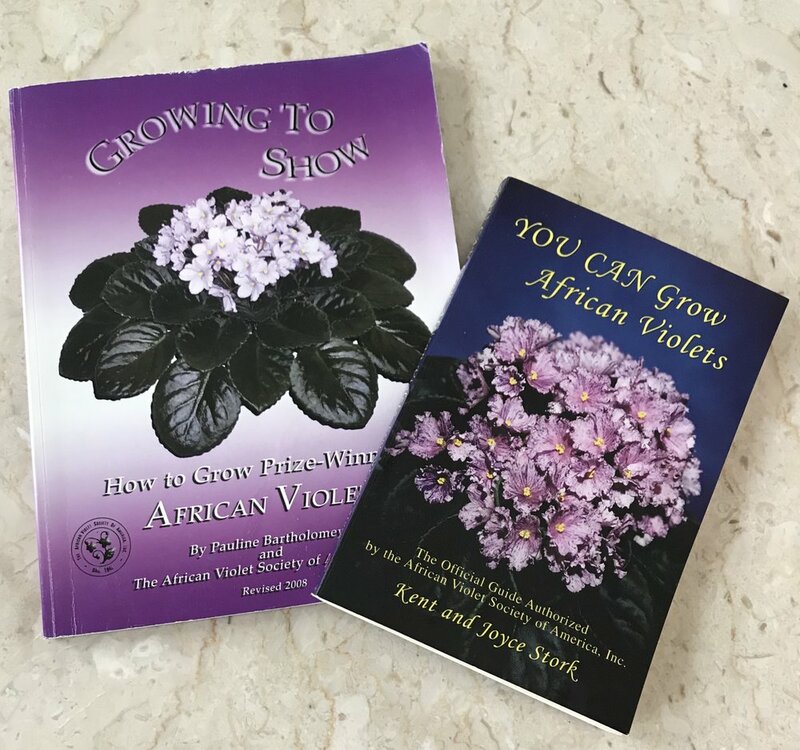 For more information on how to take care of African violets, check out the Violets 101 page on the African Violet Society of America website for loads of great advice. And don’t forget to check out Annie’s podcast All About African Violets. 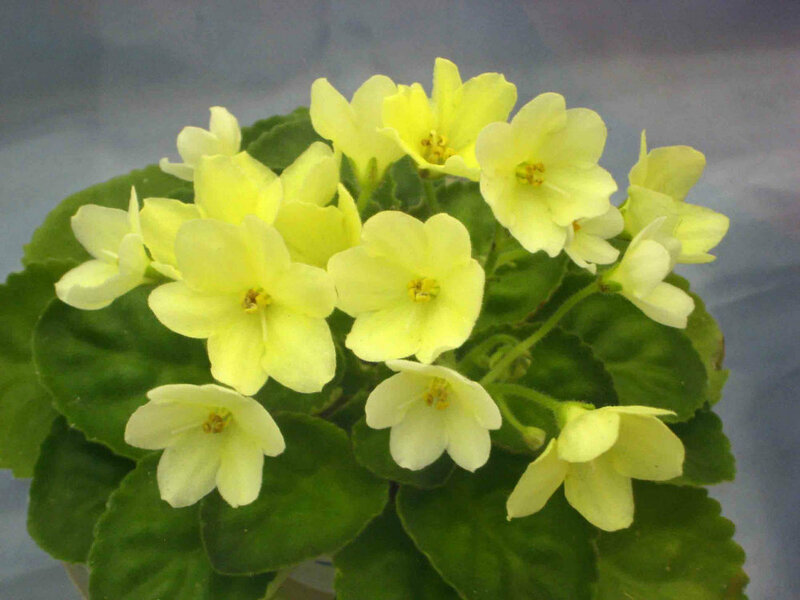 There’s also an RHS page on African violets. you’re interested in how African violets grow in the wild, read this piece in the New York Times about Mary Soderstrom’s journey to see Saintpaulias in their native home in East Usambara Mountains of Tanzania. Want to know more about changes in African violet taxonomy (they have recently become part of the Streptocarpus genus) and the history of their journey from wild plant to cultivated plant? Check out this page on the Gesneriad Reference Web. AVs are available in many garden centres, florists, supermarkets and big box stores: just take note of Annie’s advice above about repotting. If you can, buy from a specialist nursery. In the UK, Dibleys sells a lovely range of AVs; in the US The Violet Barn, Lyndon Lyon, Moonlight Nursery, Optimara. (Let me know if you have any suggestions to add to this list!). 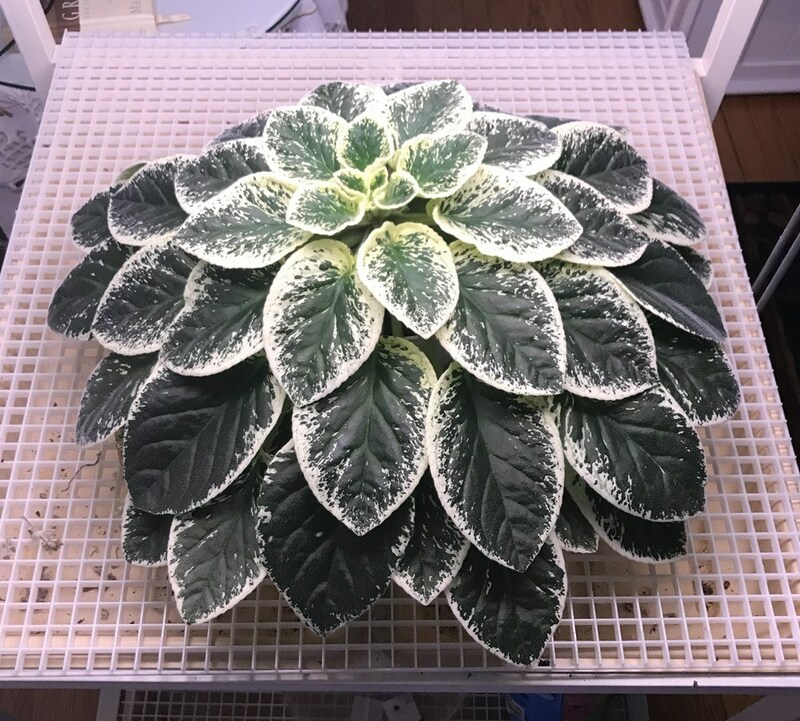 Listener Whoa Nelson wants to know why their Ctenanthe lubbersiana aka bamburanta has brown patches on the creamy parts of the variegated leaf. They wonder if it’s sunburn and if so, if the creamy parts of the foliage are more vulnerable to this. The answer is yes: the chlorophyll in green leaves helps to protect the plant from the potentially damaging effects of sunlight. Trim the damaged leaf away and adjust its light exposure so it doesn’t happen again. Want to ask me a question about your plant? Either way, tweet @janeperrone, leave a message on my Facebook page or email ontheledgepodcast@gmail.com. Don’t forget to share your sowing progress by posting the hashtag #otlsowalong on Instagram, Facebook and Twitter. Seed starting mix/compost is a fine, low-nutrient substrate for sowing your seeds: the official advice is to use fresh each growing season. If you can get hold of it, Dalefoot seed compost and Fertile Fibre seed compost are both peat-free and excellent quality. Horticultural sand is useful for mixing with with small, dust-like seed - just mix seeds with a blob of sand in your palm and spread over the surface of your compost. Don’t add anything else on top. (I know horticultural sand is hard to get in some parts of the US… this stuff is the kind of thing you’re looking for - do not use builder’s sand as it contains a lot of lime. Perlite is made from a kind of volcanic glass which is heated so it expands and the water inside escapes. Useful for adding to seed sowing substrate when you need a very free-draining mix, for example cacti and succulents. Vermiculite is made from aluminium-iron magnesium silicates that are heated and expand. Unlike perlite it is absorbent, so you can add it to substrates when your seeds need extra moisture. If you struggle to sow seeds for any reason, a Pro-Seeder may be the gadget to help. Dibbers are useful for pricking out seedlings but a chopstick, lolly stick or your fingers also work! As I already hit my goal of getting 100 patrons before I hit my 100th episode sometime in June, I have decided that I need to up my game a bit and try for 200 patrons in the same time frame. GULP. Everyone who signs up as a patron before the 100th episode comes out will get the exclusive digital artwork promised to the first 100 patrons, plus something else yet to be decided - stay tuned! Any tier counts, so by pledging just $1 a month you could help me reach my target! If you want to know why it’s important for me to increase my number of patrons, here’s why. If you prefer to support the show in other ways, please do go and rate and review On The Ledge on Apple Podcasts, Stitcher or wherever you listen. It's lovely to read your kind comments, and it really helps new listeners to find the show. This week's show featured Roll Jordan Roll by the Joy Drops, An Instrument the Boy Called Happy Day Gorkana by Samuel Corwin and Overthrown by Josh Woodward. All tracks licensed under Creative Commons. Logo design by Jacqueline Colley. Episode edited by Joff Elphick.